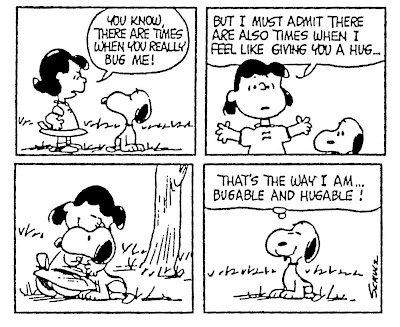 Which one can you relate to more, Lucy or Snoopy? Today, I feel more like Snoopy because I know I can turn a few worlds upside down with my reactions, and yet I’m still hugable! Just annoying, but hugable. My mother always told me her middle name was Lucy. Oh wow I will have to say that I find my self as a Lucy way to offten, I try to be a Snoopy, does that count??? I don’t want to be Lucy but I bet somedays I am. I think I’m a snoopy, too.